The Baptist church became a whorehouse. They named the church Shiloh, after the land in Palestine where the Ark of the Covenant was kept. Shiloh was an outpost of Bethel Baptist, the church that had moved to LaVilla, immediately west of downtown, 40 years prior, but Federal troops had used it as an outpost in the Civil War, and the fighting had destroyed the church. Shiloh Baptist Church was built around 1885, and the father of James Weldon Johnson, poet and Civil Rights activist, preached here for nearly 20 years. Now Shiloh inhabits land at Beaver Street and Interstate-95, having left Davis and Houston Streets when it found itself across the street from the Court, built in 1903 and soon the city’s most famous brothel. At 115 Davis Street, Shiloh Baptist Church would be one of the last whorehouses in the city, because from the early 1920s until the city finally shut it down in the early 1950s, the original Shiloh Baptist Church was the House of Spanish Marie. The House of Spanish Marie offered a church interior of six ornately carpentered bedrooms of whores. The House of Spanish Marie was the last in the blocks of brothels along Ward Street, now Houston Street, that included the Court, operated by Cora Taylor, who took the last name Crane, after the death of her lover, the writer Stephen Crane, in 1902. She opened the Court in 1903, hastening the transformation of Shiloh Baptist Church into the House of Spanish Marie. The old wood-frame church suited three decades of sin. There was no “Spanish Marie,” but there was a Carmen de Rivas, who ran the brothel for nearly three decades. Where she came from and where she went, like most human beings, no one knows. Just as most wild things enter and exit the world without our ever witnessing them, most human beings have blanks on either side of their lives. Really, even if you know, you don’t know. But at least we know more about Cora Crane than Carmen de Rivas. 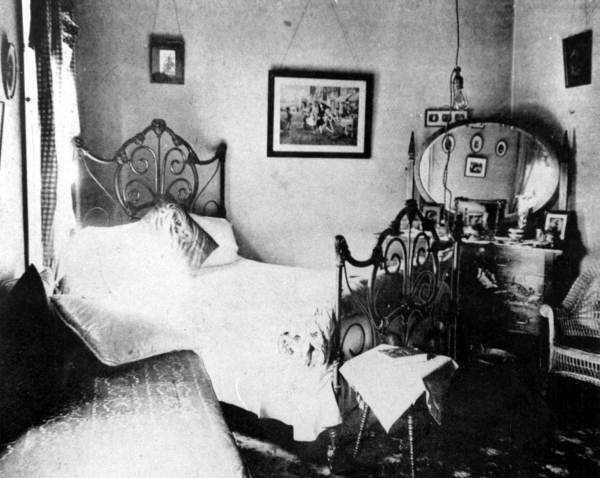 Cora Crane discussed poetry with Stephen Crane, drank absinthe, and opened and operated a brothel called the Hotel de Dreme in northern LaVilla. Stephen had written Maggie: A Girl of the Streets in 1893 and The Red Badge of Courage in 1895. On New Year’s Eve, 1896, he boarded a tugboat called the Commodore in Jacksonville, to run guns to Cuban Revolutionaries. When the boat went down off Daytona, people in Jacksonville wondered if Stephen Crane and the others had drowned. When he came back, he wrote the short story “The Open Boat” and read it aloud to friends at the Hotel de Dreme. Cora went away to England with the writer, but tuberculosis killed him in 1900. He was 28 years old. Image from Lillian Gilkes’s book Cora Crane, 1960. The Hotel de Dreme, already dilapidated, burned down in the 1901 fire that decimated the city. 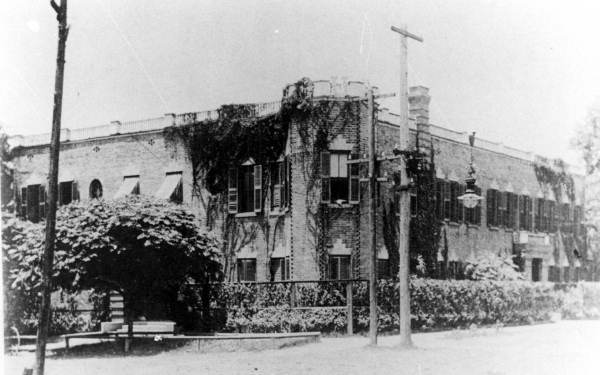 It stood at the Southwest corner of Hawk, now Jefferson, and West Ashley Streets on ground that now holds a back parking lot for the LaVilla School of the Arts. The fire took almost the whole city, but other than the Hotel de Dreme, it spared most of the tenderloin district. When Cora came back, she had the new building built. The Court was far grander than the Hotel de Dreme. It had a ballroom. 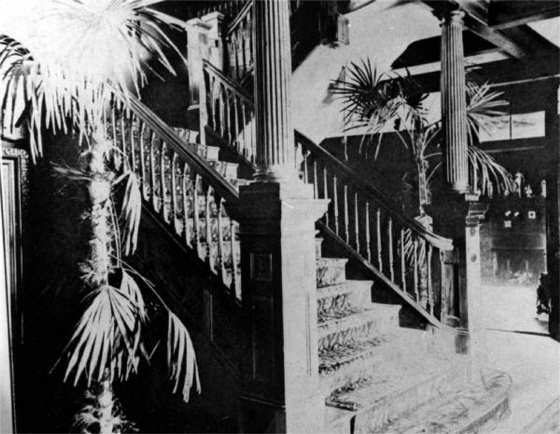 The prostitutes of the Court lived in the building in its 19 bedroom suites. They were the young daughters of poor tenant farmers in Florida, Georgia, and Alabama. Most of them couldn’t read. Some of them killed themselves. 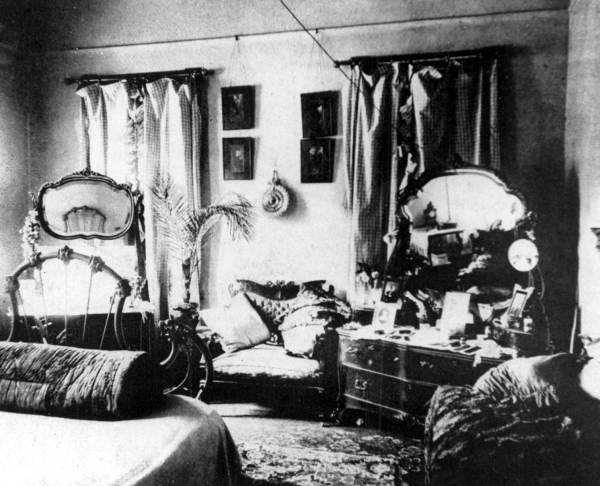 The bedrooms were stuffed with ferns and palms, marble busts, Persian rugs, leopard skin bedcovers over ornamental iron bed frames, more ferns and palms, English vanity dressing-tables with high rectangular or oval mirrors, ferns, palms, and piles of silk and velvet pillows. And more ferns and palms. Cora died in 1910. The Court gave way to another brothel called the White House Hotel and began to fall apart. Beginning in 1917, the Court stood vacant for more than a decade. People broke in. Vagrants slept there. The empty whorehouse became a dangerous place. What happened at night in the abandoned Court, as it began to fall down on itself, in that decade before it was torn down to build a warehouse around the start of the Great Depression? Like Stephen Crane, the building existed for less than 30 years. The House of Spanish Marie lived far longer.